The Sonoma Creek watershed is located in southern Sonoma County and covers approximately 170 square miles and flows 31 miles from its headwaters in Sugarloaf Ridge State Park to the mouth in the agricultural bay land areas north of San Pablo Bay. It is bounded on the east by the Mayacamas Mountains, on the west by the Sonoma Mountains and on the north by a slight rise north of Kenwood that separates it from the Laguna de Santa Rosa watershed. The watershed has a Mediterranean climate resulting in cool to warm, dry summers and cool moist winters. The mean annual precipitation is 30 inches while the average length of the growing season is 214 days (Sonoma Valley SCD, 1965). The watershed includes the City of Sonoma and the unincorporated towns (from north to south) of Kenwood, Glen Ellen, Boyes Hot Springs and Schellville. State land holdings include three state parks and the Sonoma Developmental Center. Existing Land Use Designations within Sonoma Valley include 50,622 acres of Agriculture, (56.1%); 12,185 acres (13.5%) of Residential uses, 537 acres ( 0.6%) of Commercial uses , 359 (0.4%) of Industrial uses, 6,420 acres (7.1%) of public and quasi public uses, and 1479 acres (1.6%) of developed city land. Agricultural land uses are mainly vineyards, hay fields, and dairies. The Sonoma Creek Watershed contains a great diversity of vegetation types .The watershed has diverse range of habitats from redwood/fir forests in the headwaters to chaparral, oak woodland and bay areas. Of the over 6,000 plant species in California, it is estimated that 20% occur in Sonoma Valley, in about 1% of the state’s area (Dale, 2009). As of 2005, about 60% of the watershed was covered by natural or near-natural vegetation. Approximately 26% of the watershed was vegetated by closed forest or woodland, 14% by grassland, 7% by chaparral, 10% by seasonal wetland, and 1% by riparian forest. The Sonoma Creek Watershed is also home to several special status species, meaning that the species are classified, under federal or state regulations, as being rare, threatened or endangered. Special status species in the Sonoma Creek watershed include Sonoma sunshine, Kenwood checkerbloom and Sonoma ceanothus. The largest animals that regularly occur in Sonoma Valley are mountain lions and white-tailed deer. Other large species that inhabit the Sonoma Valley include beaver, black bear, gray fox, bobcat, coyote, chinook salmon, steelhead/rainbow trout, Pacific giant salamander, bald eagle, golden eagle, northern spotted owl, and pileated woodpecker. Sonoma Valley has unusual biodiversity in a small area, an estimated 20% of California’s biodiversity in 1/10th of the area of Sonoma County, which in turn is about 10% of California’s land area (Dale, 2009). Another example of the watershed’s diversity is that it is estimated to support about 23% of the 1500 bee species found in California, again within about 1% of the state’s area (LeBuhn, 2007). The Sonoma Watershed provides habitat for many species that are listed as threatened, endangered, and species of special concern, including. The RCD has worked with many agricultural producers in Sonoma Creek to enhance their farming operations and protect soil and water resources. The RCD is working with owners of grazed lands to develop LandSmart Plans to protect and improve water quality, and to comply with the Conditional Waiver Program for Grazing Operations in the Napa River and Sonoma Creek Watersheds. The RCD has been actively working with Sonoma Valley vineyard owners and managers to develop LandSmart Plans for their properties through the RCD’s LandSmart Vineyard program. Grant funding for this planning assistance work is provided by U.S. Environmental Protection Agency (EPA) and the State Water Resources Control Board, through their Nonpoint Source (NPS) Grant Program and focused on identifying land improvements to reduce soil erosion and improve water quality in local streams. With 17 LandSmart Plans already completed and certified funding is available for developing additional plans with Sonoma Valley growers. 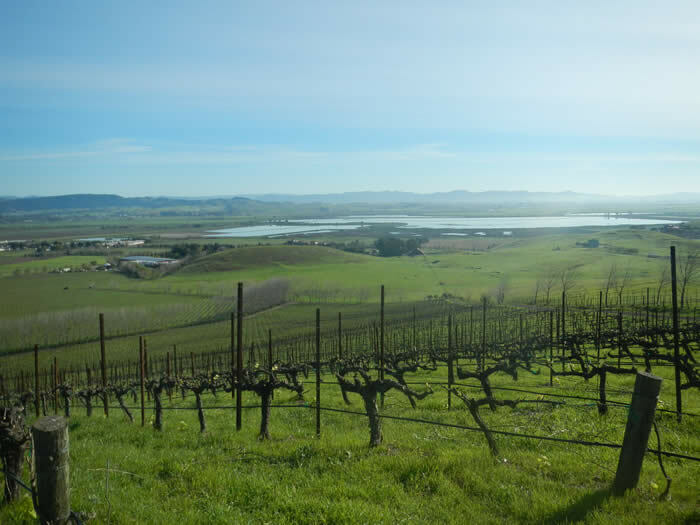 The goal of this program is to assist vineyard owners and operators in developing and implementing LandSmart Plans to protect and improve water quality and achieve the landowners’ property management goals. LandSmart Plans will help vineyards prepare for upcoming regulatory requirements, namely the Program for Vineyard Facilities in the Napa River and Sonoma Creek Watersheds. The RCD, along with ESA PWA, completed the Lower Sonoma Creek Flood Management and Ecosystem Enhancement Study (link to document in library). The purpose of this study was to identify alternatives to alleviate flooding and reduce flood‐related damage to public facilities, structures, roads, railroad tracks, pasture lands and crops while restoring and enhancing habitat and improving ecological and hydrological functions. In 2013, the RCD drafted an update to the Sonoma Creek Watershed Enhancement Plan. Draft still under review. LandSmart On-the-Ground projects often include the development of LandSmart Plans, enhancement of riparian areas, stormwater management, erosion control, and other beneficial management practices. In spring 2016, the Sonoma RCD was funded by the State Coastal Conservancy under the Prop 1 grant funding program to implement 73 structural and vegetative best management practices (BMPs) at 4 vineyards in the Sonoma Valley, previously identified from completed LandSmart Plans through the RCD. The purpose of this project is to increase the water sustainability of 4 vineyards in the Sonoma Creek watershed, by designing and implementing practices that achieve multiple benefits: water quality, groundwater recharge, water conservation, habitat enhancement, carbon sequestration, and drought and climate change resiliency.Sonoma RCD has recently been awarded an additional BMP implementation grant from the EPA and State Water Resources Control Board’s NPS Grant Program to continue implementing BMPs on vineyards throughout the Sonoma Creek watershed. Vineyards will need to first have a LandSmart plan developed that identifies resource concerns and appropriate treatment BMPs, in order to take advantage of these new grant funds. In 2013-2015 the RCD implemented a Slow it, Spread it, Sink it project by reducing storm water impacts on an agricultural property. This project restored a 600-foot reach of seasonal creek by treating a large gully and simultaneously restore floodplain function while reducing the delivery of fine-grained sediment into Sonoma Creek and improving wildlife and insectary habitat. Levee Maintenance Program: In order to maintain the levees, landowners are required to obtain permits from many jurisdictional agencies. Currently, the RCD administers several permits issued by each regulatory agency for levee maintenance activities being completed by numerous landowners in the Sonoma Creek Watershed. Read more about the Levee Maintenance Program. 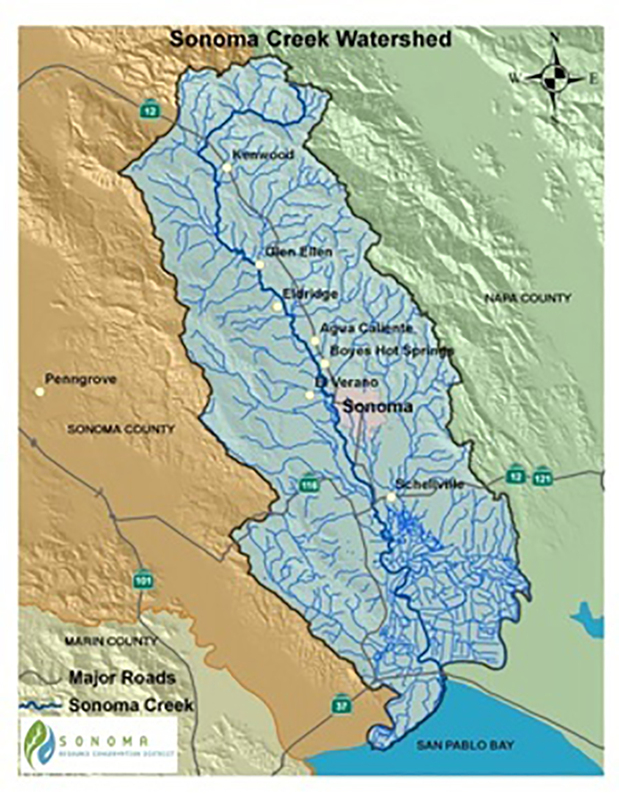 Sonoma RCD is an active member in the Sonoma Valley Groundwater Sustainability Agency (GSA). As one of our district’s major winegrowing areas, and as an area where water conservation has been deemed a high priority, Sonoma Creek is one of the focal areas of our Vineyard Irrigation Evaluation program. LandSmart workshops for agriculturalists and professionals are held as needed by the community. In 2015, we hosted an irrigation efficiency and water conservation workshop for vineyard owners. The RCD has also participated in Biochar workshops with the Sonoma Biochar Initiative to provide land managers options for increasing soil health and redirecting carbon with materials from their operations. For more information about the Sonoma Creek Watershed, please contact Valerie Minton at 707.569.1448 ext 102 or vminton@sonomarcd.org.